“Well, dam it,” somebody said, “It might help.” So, the U.S. Army Corps of Engineers began the task in 1954 of constructing Table Rock Dam to ease the Branson flooding from the White River and Lake Taneycomo. It seemed like a good idea at the time, unless you lived down stream of Branson in the little town of Rockaway Beach, which was hopping with life. That dam thing almost killed that town. 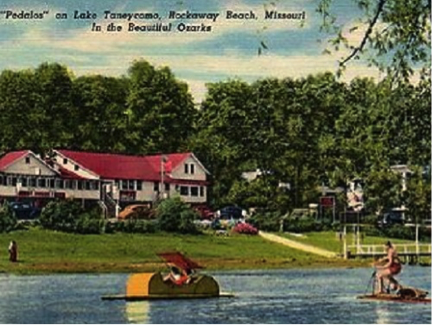 When Branson wasn’t much more than a float trip excursion, a movie theater, and a post office; Rockaway Beach, a quiet getaway on the banks of the White River and Taneycomo Lake, was the place to be. 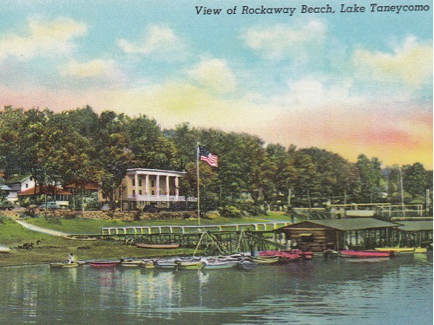 The rocky shores of Rockaway Beach were the area’s go-to destination for honeymoons, senior trips, vacations, beach, hanging, swimming, and to have a party all the way up to 1959 when dam generators started churning. Branson had little to offer in comparison. Table Rock Dam changed all that and ironically, another dam was the reason for Rockaway Beach. 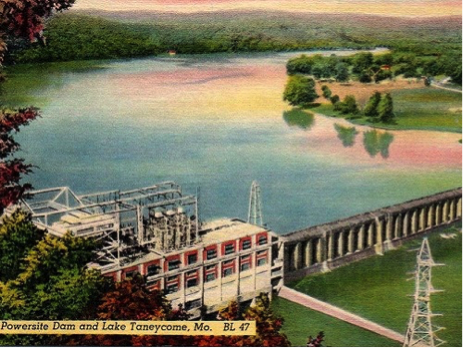 In 1913, the first power-producing dam west of the Mississippi was built by the Empire Electric Company: Powersite Dam. Holding back the water of the majestic White River for power (and allegedly to slow the flooding) that old dam, (that still stands) created a haven for recreation and a few other things. It wasn’t a huge lake, but it did have amazing scenery of cliffs and an alluring beach. It was a fine place for a dam site. 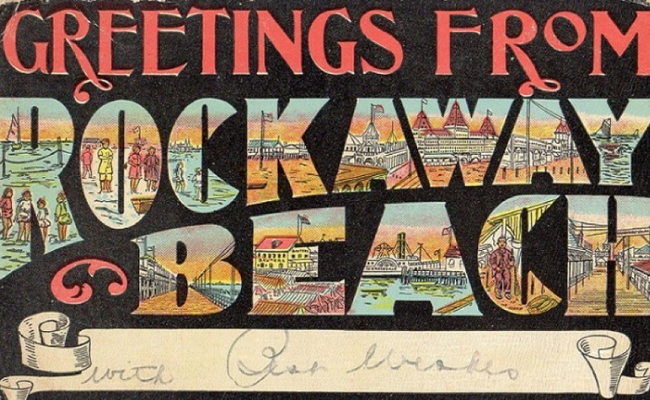 Rockaway Beach got its feet wet in the 1930’s during prohibition. Those old stories of moonshiners and bootleggers were very true. Big shots from the mob came to Rockaway for the potential, the booze, and a little anonymity. The water was crystal clear for fishing, swimming or producing some mighty fine white lightning (moonshine). Speakeasies were about celebrities and folks who snuck to the rocky beach (gee, I wonder if this is how the town got its name) along the Shore of Taneycomo Lake/White River for solitude and drink. The end of prohibition didn’t stop the town from being a hot spot. Word had already spread that folks could have a good time on many different levels, but those good times were regularly interrupted by massive floods of the powerful White River that starts in Arkansas, horse shoes to Missouri and then back into Arkansas. The Ozark Mountains are one big canal to multiple streams and most in the Taney County lead to the great White River. Branson was often decimated and Rockaway’s future as a tourist destination began to fade when Table Rock Lake began construction. The 252 foot high, mile-and-quarter long dam was completed in 1958. Table Rock Dam wasn’t bad for Rockaway until June of 1959 when the four generators began bringing the gift of electricity. The water from Table Rock Lake began to flow through the generators from well below the Thermocline (aka thermal layer) and untouched by the sun. That chilly water turned Taneycomo Lake and the White River from a haven for swimmers to a breath-robbing 50 degrees all year round. Needless to say, those vacation travelers migrated upstream to Branson to enjoy the new 79-mile-long, 745-miles-of-shoreline of Table Rock Lake. 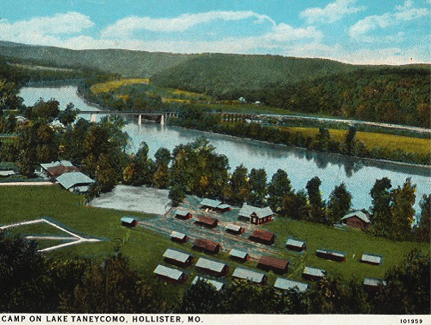 A trout hatchery was created for the “new” chilly Taneycomo Lake/White River since the indigenous fish couldn’t survive. It was hoped that the trout hatchery would also draw people to Rockaway, but it never caught on as well as it did in Branson that now had the benefits of warm water and cold water. In 1959, a few hillbilly musicians began entertaining in downtown Branson near the shoreline in a modest building for the visiting fisherman. The first music show was born and the little town of Rockaway Beach never recovered from the cold water and the convenience of Branson. Rockaway Beach, with a small population of under a thousand people, has some nice fishing and boat docks. A drive through the area still shows plenty of evidence of how it was the place to be. Branson can thank Rockaway to some extent for initially drawing certain types of tourists and eventually upstream to them, but one can wager that there’s some dam bitterness about the results of that dam thing. Follow Spinnaker Resorts on Instagram, Facebook, and Pinterest!